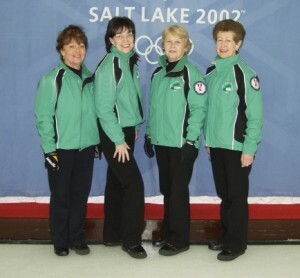 THE senior ladies team heading to the world championships in Fredericton, New Brunswick, Canada, in April got back on the ice last weekend. This was their first time back together since last year’s championships in Copenhagen. The team – Marie O’Kane, Louise Kerr, Gillian Drury and Christina Graham were put through two tough training sessions by gold medal coach Gordon McIntyre at Greenacres Ice Rink. The ladies did timing drills, throwing stones in rotation at the times called out by Gordon – 3.10; 2.80; 2.20; 2.50. The stats from four repetitions of that were then calcuated and we got the results back the following day. Room for improvement all round! Laser technology was also empoyed by Gordon to make sure the team were lining their stone up directly at the brush at the set up point. Room for improvement there too! Strategy was worked on, sweeping skill and communication polished up and to finish off we had a fun game of pairs. The ladies were very grateful to Gordon and the time he spent with us. We learned a lot and plan to meet up with the coach a couple times more before heading across the pond.